Barrie, Ont.-based Georgian International is not your typical Canadian company so it should be no surprise that its residential development, Braestone in Horseshoe Valley, stands out from the crowd. The company’s Braestone development was recently named Best New Home Community of The Year for 2016 by the Canadian Home Builders Association. (The Braestone Discovery Centre was also named 2016 Best Low Rise Sales Office in Canada by the CHBA). Braestone would never be confused with a cheek to jowl suburban development. Situated on 566 acres that include a working farm in Horseshoe Valley, the development offers “homesteads” on estate lots of up to 1.5 acres. The development is targeting empty nesters attracted to a “modern interpretation of ‘country style’ design…influenced by the farmhouses, sheds and barns of the Oro-Medonte Region,” explained James Massie, president of Georgian International. Massie runs Georgian International with long-time business partner David Bunston (the 59-year-olds have been friends since age 12). The duo has taken a patient approach to the Braestone project. They purchased the land in two transactions at the start of this century with an eye to creating a unique development that incorporated a working farm property. “The acquisition of the working farm was really to fulfill this vision of building a community that was much different than what anybody else in the market was doing,” said Massie. The development will feature 229 estate homes that are intended to function as a community and highlight the project’s four-season appeal. It already boasts 10 miles of trails for activities such as hiking, cross country skiing and snowshoeing. Massie said his company is just about to deliver its first home to a buyer and expects to build at a pace of approximately 40 to 50 homes per year. Prices for the homes range between $550,000 and $1 million with the average home running around $700,000 he said. That’s a lot for the Barrie market, but not head spinning for residents of the Toronto area just an hour’s drive away. Massie, who can track his Barrie roots back to 1929 when his WW1 veteran father came to the town, has a summer home in the area as well as his business, one of Barrie’s biggest with 600 employees and annual sales of $300 million. Massie’s first Barrie business started in 1981 when his father helped fund the purchase of a Pontiac dealership. Today, the diverse company’s holdings includes three automotive dealerships (it is General Motor Canada’s top selling truck retailer) and Air Georgian Ltd., which operates 19 aircraft and provides scheduled passenger and executive charter flights as well as aircraft maintenance to major airlines and companies. Its real estate division, active since 1985, is focused on the Simcoe Country area surrounding Barrie. Massie noted that his company came up with the homestead concept on its own. 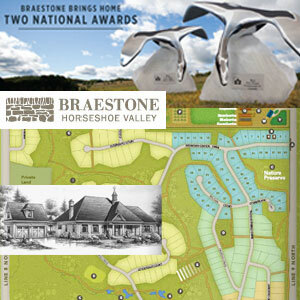 The Braestone development features bungalow and two-storey floor plans designed with a ‘continuation architecture’ approach: principal rooms at the home’s core, “resulting in more majestic homes with wider, more expandable and more interesting layouts that better complement Braestone’s large acreage lots.” As well, strict architectural guidelines for exteriors will ensure a consistent look throughout the development. Massie sees the development as a more affordable and less intensive alternative for GTA residents who want a country home. Georgian International has another Barrie-area development underway: the Windfall Blue Mountain project which features detached and semi-detached “mountain homes” from $400,000 to $500,000. The 200 acre project envisions more than 600 homes there upon completion.